Black dress with butterfly lining, by Rohit Gandhi and Rahul Khanna, for Cue, at Ogaan, Mumbai. Purple halter dress with crystal embroidery, by Cherie D, Mumbai. Riyhad Kundanmal was one of Mumbai’s merry bachelors and unabashedly lived by that cringingly hideous cliché: Single and willing to mingle! Little did he realise that at one of his hedonistic parties, as he swaggered about playing host-with-the-boast, in would walk a lovely young girl, uninvited, as it turns out, who would yolk him to domesticity almost effortlessly. Both of them are thriving professionals and take great pride in each other’s accomplishments. Riyhad’s architectural practice spans institutional work, homes and offices. He was holed up at the Woodbury University, California, for several years, but it isn’t as though it has been all work and no play. Having explored modelling for a bit, playing polo for the other bit (something he won’t allow Alisha to do, although she’s a passionate horse rider), he was, however, very serious when he joined his father, Ramesh Kundanmal, in the family conglomerate encapsulating real estate development, automobile dealerships, property and estate collection and enhancement and paralegal services. From day one Riyhad involved himself in the fields of designing, developing and selling ‘boutique’ homes and properties. Right now he is developing luxury villas in Alibag, which come with a yacht thrown in! Very recently, he has started Ocean Crest Marine, a company selling yachts – a perfect adjunct to one of his own pet passions. He recalls his frustrating personal experience of finding himself a yacht in India, prompting him to import them into the country for his clients and other sailing buffs who face similar problems acquiring one of their choice. With the Indian coastline still virgin to the yachting experience, Riyhad has acquired large chunks of ocean/creek front land for the setting up of his enterprise that also encompasses back-end operations like servicing, pre-delivery inspection and maintenance. Yachting, he believes, will be the next big lifestyle buzzword and the perfect accessory for the perfect home. 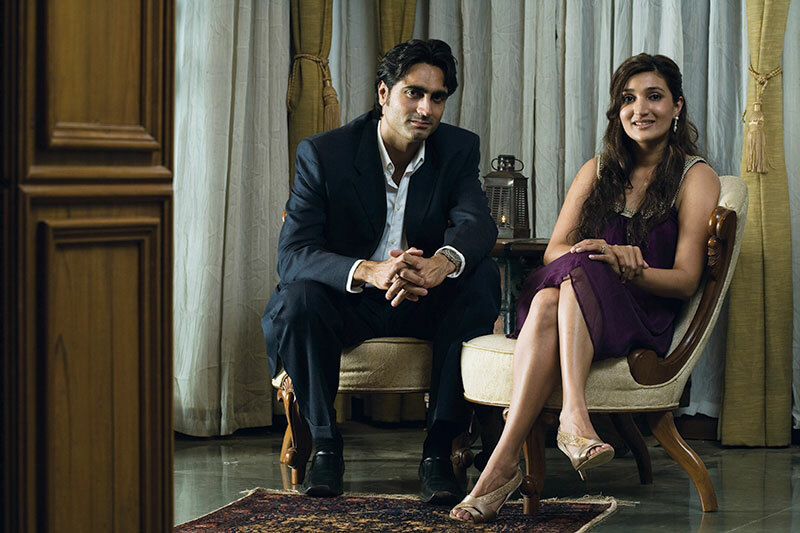 An avid pursuer of all things premium, Riyhad lives the lifestyle he propagates: a stunning beach-side mansion in Mandwa, a beautiful 25-seater Sunseeker yacht – ‘Truly’, a beautiful bungalow at Bandra and a gleaming wine-red Jaguar purring in his garage! Alisha echoes his simplicity. As a scion of the ‘Parle’ Chauhans she, too, hasn’t been lacking in luxe, but opts to play it down. Her sartorial preferences are straightforward. She values casual comfort way above designer diktats, although she does grumble that post-Nikolai nothing fits her anyway. Classic and feminine in her style, she does, under oath of secrecy, confess that she is a shoe fiend and somewhat obsessive about handbags. At the moment, she is juggling motherhood with the see-saw of mental confusion over how to spread herself across a very brimful life. “Having Riyhad around helps,” she concedes, “he helps me stay grounded. Home and baby will always be a huge priority, but I don’t think I could ever really give up work completely.” So, right now, Nikolai accompanies her to office, although he excuses himself from some really long meetings! Riyhad’s day is more chaotic by far, shuttling between Alibag and Mumbai, dealing with the demands of clients for both his yachts and villas. Really long hours, construction schedules going haywire and missed meals are all par for the course. Understandably, he stays lean and mean. Alisha offers that it also has something to do with a very fussy palate. Finicky foodie that he is, his meals must be just-so. Alisha, who had seldom stepped into the kitchen before the prefix Mrs arrived, has started whipping up chicken casseroles and pita roles like a pro. Well, look at where crashing somebody’s party gets you! As a parting shot, Riyhad sets the record straight. “A friend of mine, Waheeda Rehman’s daughter, Kashvi, used to keep telling me about this girl she thought was perfect for me. That was, of course, Alisha, who was dragged to my house for a party by a friend who also wasn’t invited, so that made two gate crashers that evening,” he jokes. But the joke was on him as he thought Alisha was her sister, Schauna (the two look very similar). He learnt of her identity only as she was leaving, and had to leave it to chance to get them together again. It happened soon enough, at another party. He walked up and told her a common friend had suggested they get married, and he was considering the prospect. She laughed. They chatted until four a.m., and for months thereafter, mostly on the phone. Then she asked, “Don’t you ever meet your friends?” So they started meeting and were married soon after. 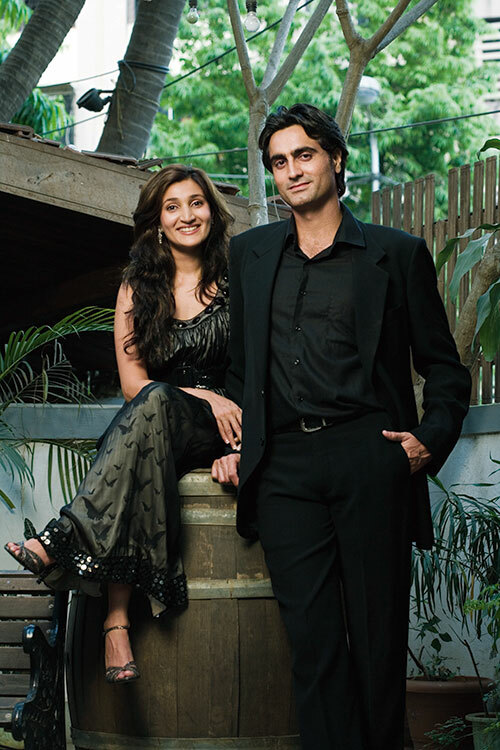 He proposed while they holidayed in Bali, and came back and built a splendid bungalow at Mandwa to host their reception.